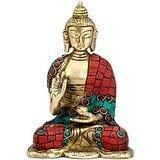 Buddha Statue Buddhism Tibet Medicine Brass Buddha Idol The Varada mudra (favourable mudra) signifies offering, welcome, charity, giving, compassion and sincerity.Made from Quality Brass and Handmade in India. Size : 5 Inches Height X 3.5 Inches wide X 2 Inches depth. Weight : 0.66 Kg. Material : Brass , Turquoise and other coral stone Handwork. -------------- Pls beware from Copy product & ensure buying authentic product. This is exclusive product of Brand " Collectible India" and "covered by intellectual property rights laws". 'Collectible India' do not authorize any other Brand/Seller to sell it and won't be responsible if any copy or substandard product send by any other seller.